Noisy, smelly, crowded, dirty. Just a few words that perfectly describe Bangkok. Perfect, Bangkok, you are not. Take a turn to the left and you’ll be hopelessly lost, take a turn to the right and you’ll end up in some place you don’t want to. So keep moving along and mind your step. Occasionally, take a few steps back and look around to get your bearings. Whatever you are looking for, here it is, because Bangkok has everything you want and everything you didn’t ask for. Indeed, you won’t find a metropolis in the world that doesn’t offer two sides, but few cities blend both sides together like Bangkok; it makes the bad feel good and the good feel better. The moment you arrive, you want to be some place else, and when you’re some place else, you can’t wait to get back. Should your time in Thailand be limited, you can make the most of it by spending a few days in the nation’s capital, for it has a lot to show and offer, all within a manageable distance of one another. Interested in Culture? Walk in any random direction and you’re bound to run into a temple open for visit. Want a go at Thai food? Be sure to ignore the large restaurant in the more popular zones. Go where the food vendors are. Start at one end of a street and work and chew your way to the other. By the time you get there you’ll have had a king’s feast for a beggar’s price. Even in this city of millions you’ll find parks and places where things are quieter, less crowded, nicer. Though there’s a lot to do in the city, there’s only so much time you should spent there. Pick the things you want to visit most and go for it. Take a day to visit the grand palace and the surrounding temples such as Wat Pho. Take another day to go shopping. Visit the floating the market, maybe a mall or two, then end the day relaxing in your hotel or something. Unless you’re a resident, spending too much time in the city will just get on you’re nerves and you’ll only end up getting frustrated. Go from A to B and end witch C. D, E and F are for another time. 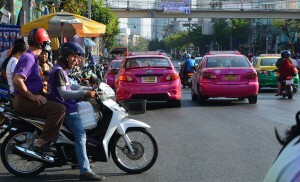 Speaking of moving, travel in Bangkok is an experience on it’s own. Keep in mind you’re taking a calculated risk every time you venture out there on the streets. It’s chaotic, noisy, smelly, occasionally dangerous. Traffic laws? More like guide lines. Unless your name is Max and you’re mad, be sure to keep in a mind a heart attack or two are part of it. Still, there are fun, great ways to explore the city. Take a trip with the sky train and see the city from higher up. If you feel like it, take a bicycle tour. There are several being offered and it’s a brilliant way to explore the city. Water buses are another cheap and efficient way to go from one place to the other. You want to take the tuktuk? Oh alright, take a ride in the tuktuk, why not? Travelers on a budget shouldn’t have to worry too much. Thailand is cheap place to visit, though Bangkok is slightly more expensive. If you’re budget is limited, it becomes tempting to stay at a place like Khao San road, where the hotels (and more) are cheap, you have to keep a few things in mind: the food in the restaurants isn’t all that good; less Thai and more catered to western tastes. Vendors sell low priced trinkets, souvenirs and clothing, but what they sell falls apart rather easily. And it’s popular, very popular. Thousands of people packed in a single street kind of popular. People screaming through the hotels in the middle of the night kind of popular. Extra bonus: pushy cab and tuktuk drivers, skilled in the arts of bugging people and charging more than drivers in other parts of the city. If you don’t want to spend too much money and if you want to party hard, search no further. If you’re like me, avoid it as much as possible. Bangkok is a miniature Thailand. It has everything the rest of the country has, even if the rest of the country has it better. Some miles outside of the city and the temples become more impressive, nature becomes beautiful and the food tastes better. But only in bangkok can you find all of it in one place. Its combination of wonder, charm, mess and everyday chaos breeds an authentic atmosphere. It’s a city a that on occasion feels more surreal than real. It’s an adventure, all dangers of questing included. You’ll have to surrender yourself to the madness to enjoy it. If you do, you’ll enjoy it immensely, just be sure to enjoy it responsibly.